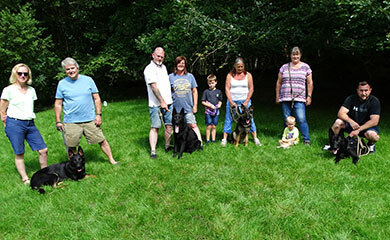 After being imported from Germany brothers Garry and Gunnar have settled in well with their puppy walking families and attended their first training session on Sunday 13th of August at HQ. 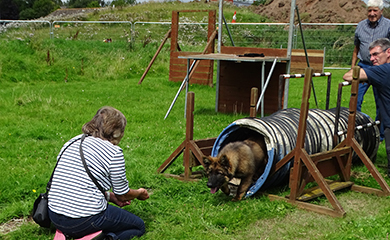 As always we introduced them to our tunnel and agility ramps which are ideal as we start the process of gradually building their resilience to new experiences and situations. Here is Isabel guiding Gunnar up and down the ramps. Here is Jill doing the same with Garry. Garry was a bit slow on getting the hang of the tunnel but once he got the idea we couldn’t stop him. 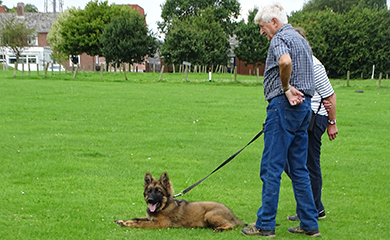 Here is Garry patiently watching Gunnar and Hannah practising their sit’s and down’s. Next it was Gunnar’s turn to watch and learn with Jill and Garry practising their finding the leg exercise and heelwork. For such young pups their concentration was excellent. We then finished the control exercises with some recall work. 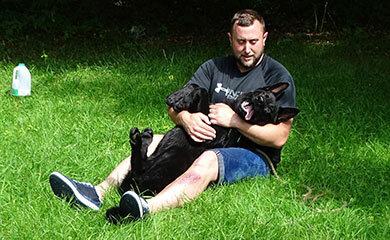 Recall work is very important because one day it could save the dog’s life. 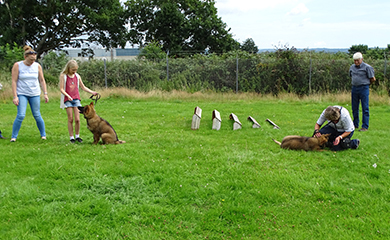 Next we introduced the pups to the one exercise that all Police dogs need to be very good at ie tracking. 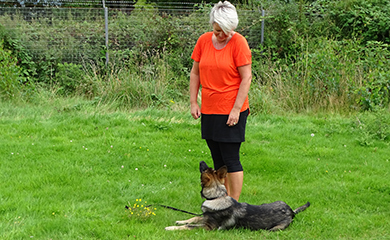 Tracking is where we condition the dog to follow the trail of a person. 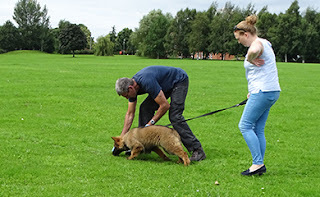 This is probably the number one exercise for a Police dog because it helps us to locate criminals who have fled the scene of a crime or to locate vulnerable missing persons. 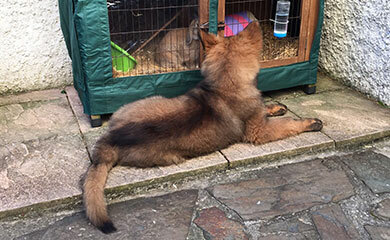 Here is Garry waiting patiently for his turn watching Gunnar. 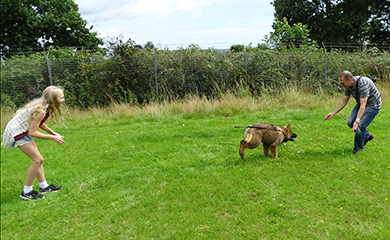 Gunnar is a natural tracker pictured here with a nice low nose following the trail I have just laid. 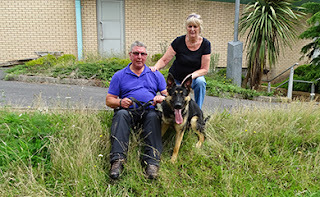 Garry might look laid back but his drive to track is there for all to see. Isabel and Gunnar already looking a great team. Who knows a future dog handler in the making. 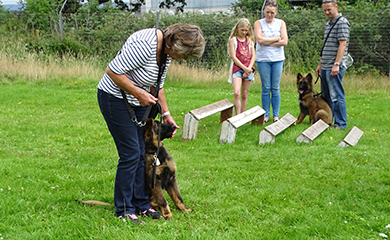 Unfortunately Eric and Elsa couldn’t make the training but we were joined by Eva who is now 6 months old. 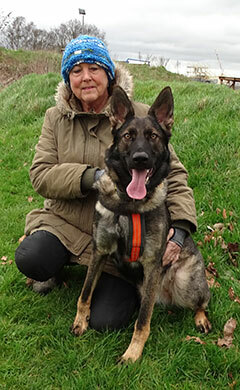 Lisa and her son Billy are first time puppy walkers and only recently took Eva on from temporary walkers Colin and Mitzi. 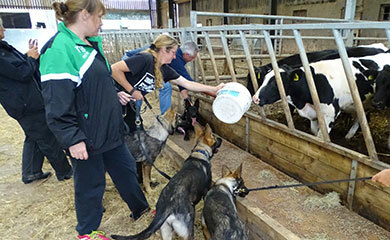 Other than the farm visit this was only Lisa’s second training session with Eva but it didn’t show. 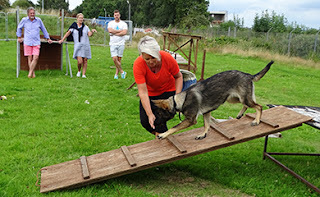 Eva loved the agility equipment and Lisa also gave a super demonstration of a down stay and return with Eva. Their recall was pretty good too and Eva’s tracking was very impressive. 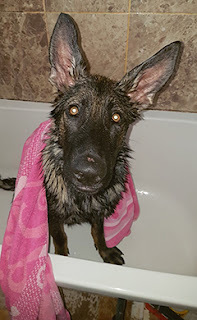 Although Eric couldn’t make the session his walker Terri sent this picture of Eric looking a bit sorry for himself after rolling in a bog and then needing a bath. 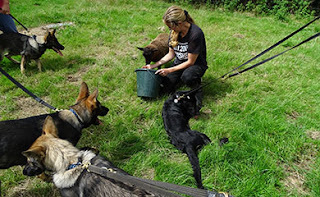 On Monday this week I assessed all 5 dogs on their article searching and introduced them to the first stages of criminal work. 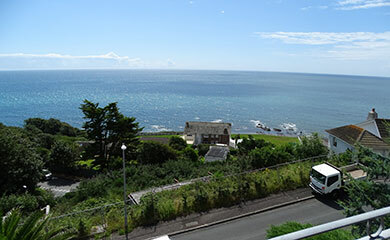 After that we all moved to the old Exmouth college to introduce them to person searching. 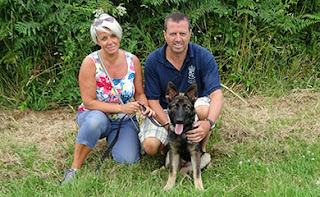 TAG WITH NIGEL AND SUE WHO ARE LOOKING AFTER TAG WHILE HIS PUPPY WALKERS ARE ON HOLIDAY IN AMERICA. Oscar was a bit lethargic on the criminal work and article searching. Ozzie has also been very poor on his tracking on our previous session and so I concentrated on his tracking today. 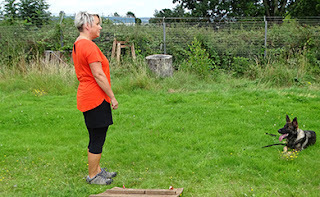 He was very unfocused and lacking any determination again. 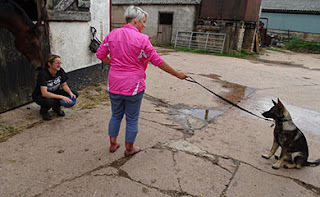 I have decided to have both dogs in for a week’s remedial work to improve their performance in these areas over the next few weeks. Here is little Tammy on her first go at tugging work which was good for her first attempt. 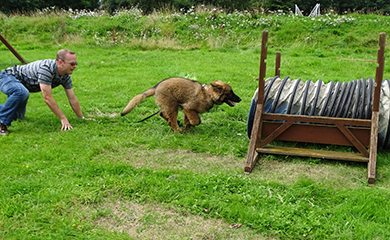 These are the very early stages of getting the pup to enjoy fighting the helper for the tug toy and this will eventually develop into chasing the criminal wearing a protective sleeve. 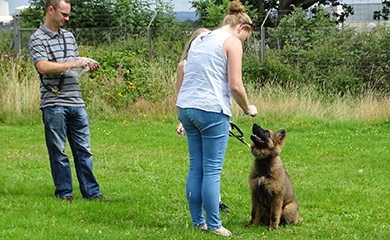 We then went on to Exmouth for our introduction to person searching. All of the dogs loved this and did very well. 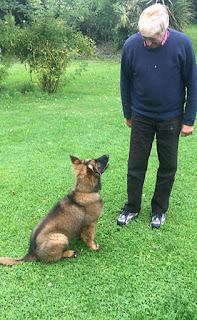 Here is Tag on his introduction to person searching and considering last time we could not get any sort of a bark for his toy this time was excellent. We also took the opportunity to make sure that all of the dogs were confident on shiny slippery floor surfaces and I am happy to report that they were. 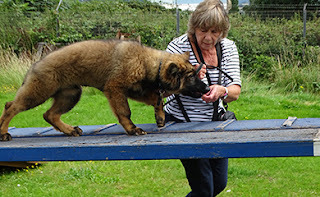 Here is Tag very comfortable on the shiny gym floor and at the same time tugging on the ropes which make a loud metallic noise on the overhead runners. 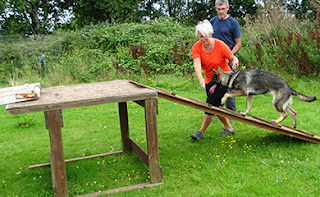 These runners do upset quite a few dogs but as you can see Tag is pretty bomb proof. 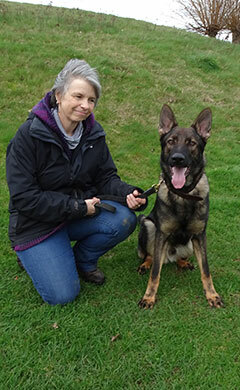 Tag went back to his puppy walkers on Tuesday and was reunited with his best mate Marina. 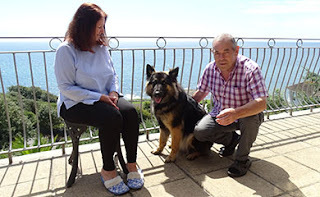 He did enjoy his temporary stay with Nigel and Sue and we are grateful to them for looking after him. I would also like to thank Mary who has helped with looking after Tara, Elsa and Tammy while walkers have taken short breaks. 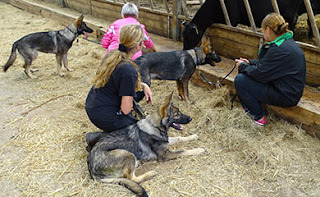 Last week I travelled to Belgium and Holland to select 4 pups for our puppy program. In my last blog I showed pictures of the pups in Holland. The pups in Belgium were bred by my friend Walther Verbruggan. Here are the 2 pups I have selected Quest and Queni for our program from his litter. I was very impressed with Walther’s litter they were in excellent condition and bred at his home from his only dog Faye. I am extremely excited about the pups from Holland and Belgium because hopefully they will be the final piece in the jigsaw in building our own breeding program so we don’t have to rely on other breeders providing the dogs that we need. 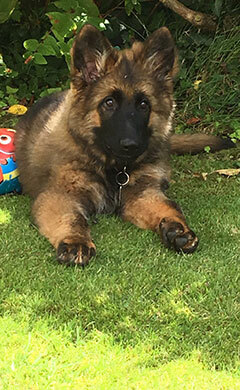 To have the pick of such a superb litter is very exciting. 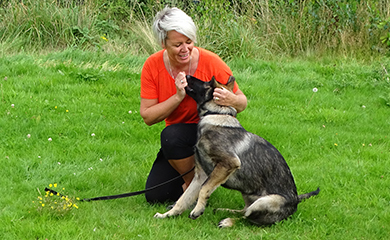 I am often asked why do you need to go abroad for pups? 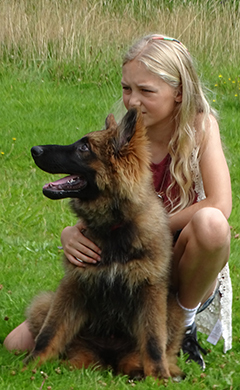 The reason is there are so few breeders in the UK who breed pups of the calibre we need. 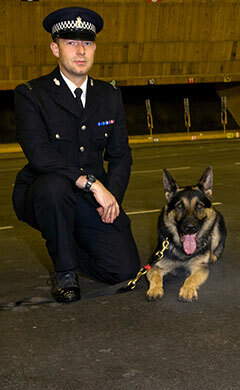 The ones that do breed pups of the calibre we need have many Police forces competing for their pups. I am very pleased with Eric and Elsa who we acquired from Kazzardsway German Shepherds in Manchester and hopefully Bernard will provide other pups for us. 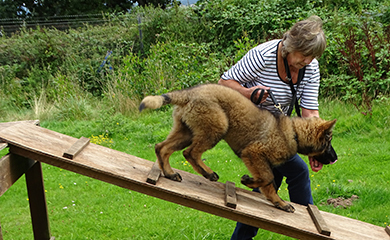 But breeders like Bernard cannot provide all of the pups we need hence the reason for building our own program. 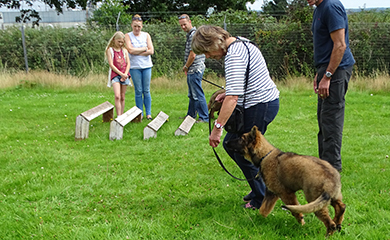 Next time I will update you on how Ozzie and Oscar get on with their remedial work and will update you on which Police dog teams will be starting their Initial Police dog course in September. 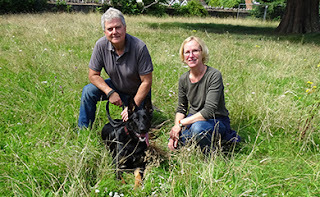 Last week I collected the latest pups to join our program Garry and Gunnar after they arrived from Germany. I brought them back to our house to settle in and assess them both. 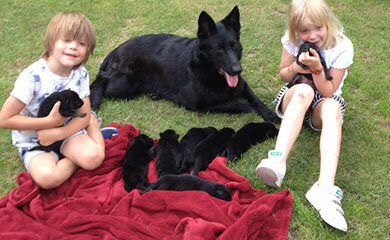 They were born on the 11th of April and were bred by the same breeder who bred Lenny, Ella and Eva. 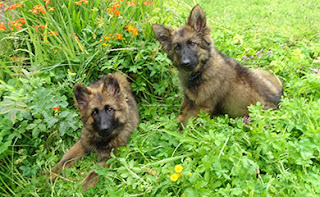 They didn’t take long to settle at my house and were soon off exploring the garden. The first job was to put collars on them because without collars I couldn’t tell them apart. 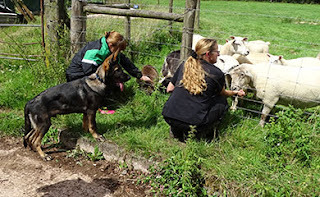 The next job was to get to our vets for a health check and confirm their microchip numbers. 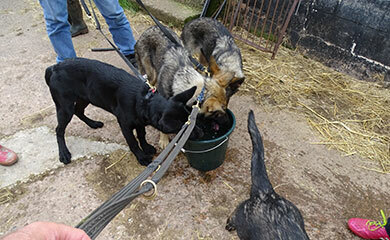 Gunnar is in the red collar and Garry is the blue dot collar. 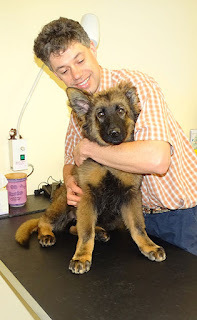 Garry was quite happy being examined by our vet Nick. Garry also struck up an immediate rapport with Rudy. 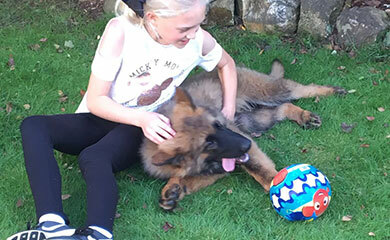 In fact both pups got on very well with all 3 of my dogs Rudy, Sasha and Ella. 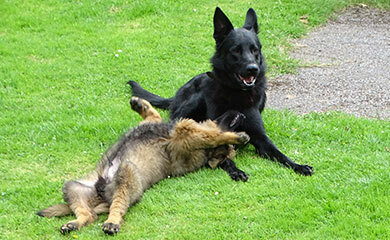 They are shown here relaxing in the garden together. 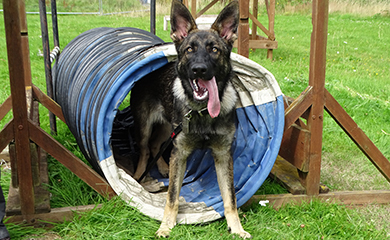 She hasn’t been getting involved with the other dogs lately and has been sleeping a lot which we suspected was because she was pregnant having been mated to Police dog Yogi 4 weeks ago. However she had a scan on Friday this week which proved negative. After assessing them both and on day 3 it was time for them to go to their new puppy walkers. 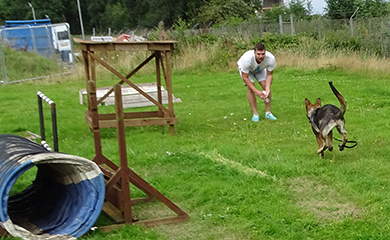 Here they are having one last run around before their puppy walkers arrived at our house. Here are the boys with their new puppy walkers just before leaving to go to their new homes. 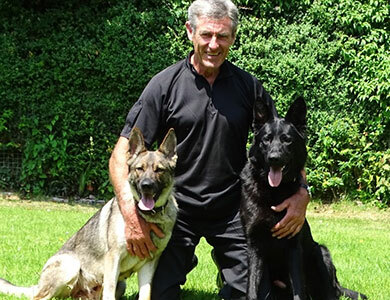 Garry is on the left having been allocated to experienced puppy walkers Terry and Jill from Exeter. 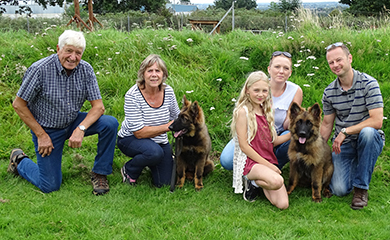 Gunnar is on the right with new puppy walkers Hannah and Mark and their children Isabel and Alex who live in Plymouth. 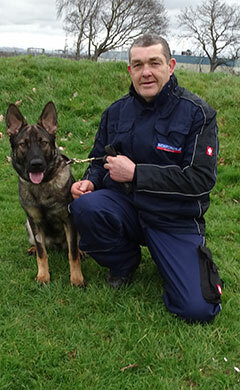 Garry and Gunnar will now join our September 2018 Initial course group which currently includes Eric, Elsa, and Eva. This will become a large group with 3 further pups due to arrive from Holland and Belgium in early October. 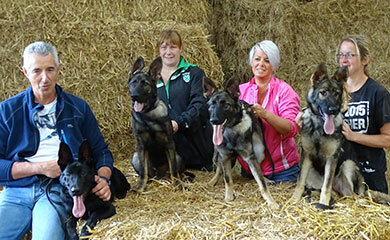 This group will hopefully provide 2 breeding females which hopefully will result in us breeding most of our own pups in the future. 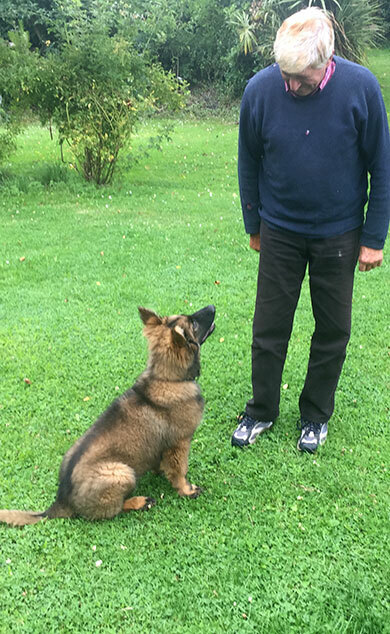 Malcolm Pearce was the main German shepherd breeder for our force from the year 1999 to 2012 providing many excellent German shepherds with very strong characters. 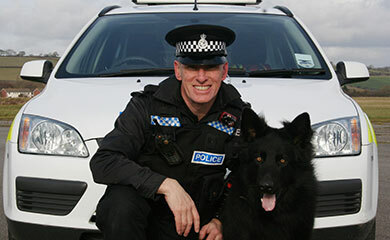 Here is Chris Carter and Maverick our one remaining operational Police dog from Malcolm’s breeding. 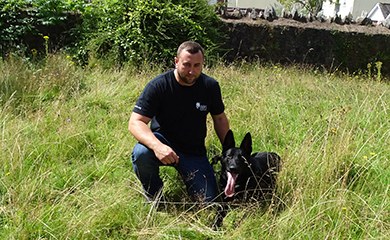 They are stationed in North Devon..
Another of Malcolm’s very successful dogs also stationed in North Devon and only recently retired is Archie pictured here with handler Ritchie Irwin. 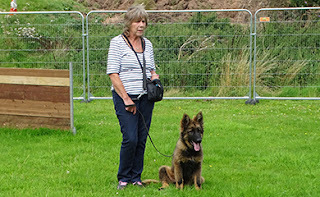 Malcolm was the go to guy if you needed any advice on German Shepherd pedigree’s because his knowledge was second to none. 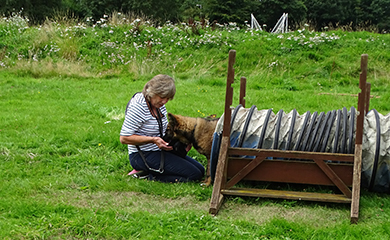 That was how I first got to know Malcolm by ringing him for advice. From there we had many fine dogs from Malcolm and he continued to give me valuable information with the start of our own small breeding program. 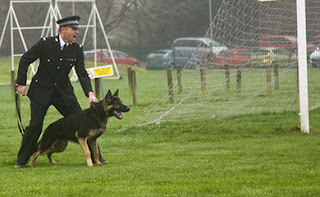 She was delighted with our gesture of appreciation of the many fine dogs Malcolm provided our force. My only regret is not thinking of doing this while Malcolm was alive because not only did he deserve it but he would have been overjoyed because the GSD was his life. 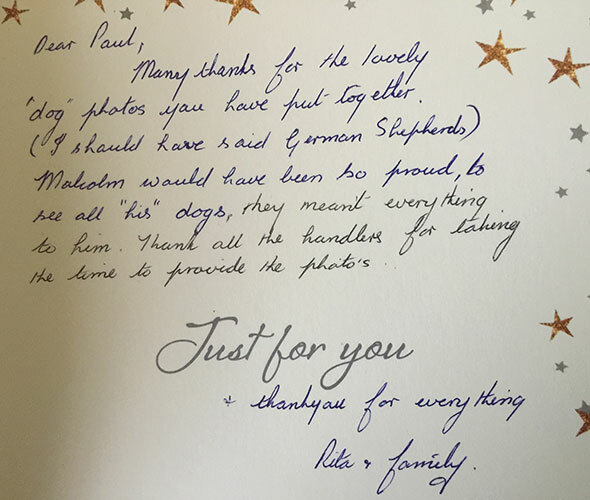 Here is a copy of the card of appreciation sent to me by Rita to our handlers. 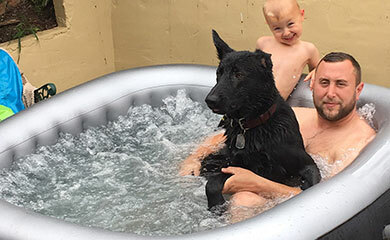 As lovers of the German Shepherd many of us try to make some small contribution to the legacy laid down by the founder of the breed Captain Max von Stephanitz by training, breeding, caring for or maybe just enjoying his beloved breed. I think I can say with confidence that Captain Max von Stephanitz looking down would have been very proud and honoured with Malcolm’s contribution to the breed. 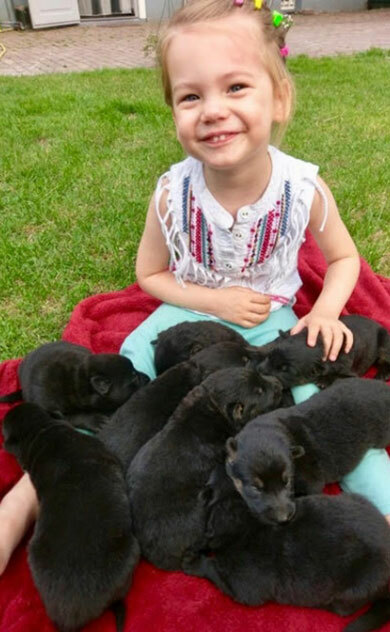 Who knows maybe they are up there now enjoying a chat together about their beloved breed and knowing Malcolm he would probably be uttering some expletives about some of the idiots down there doing their best to ruin our wonderful breed. 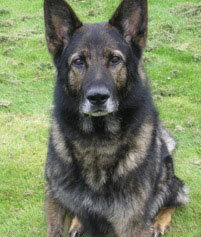 "Malcolm thank you for your dedication to me and my breed. Thank you for giving me the opportunity to serve as an operational Police dog and the wonderful life I had with my handler Phil. 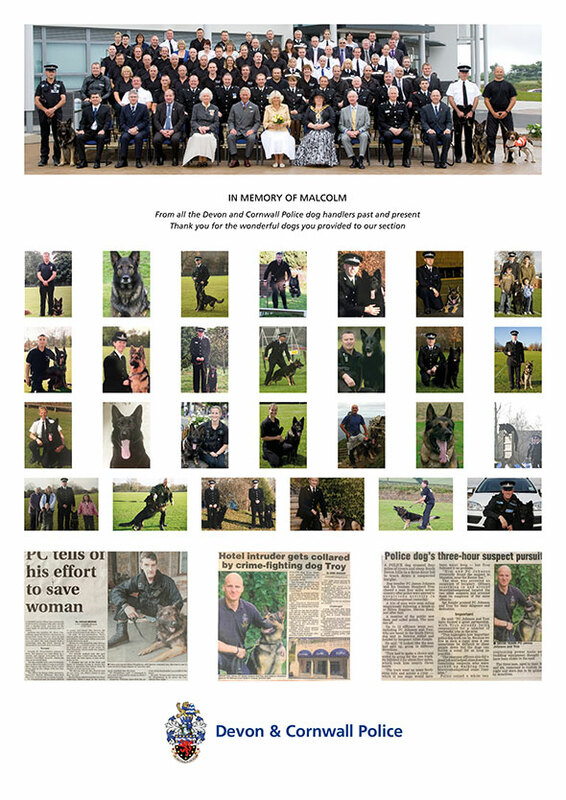 Thank you Malcolm. 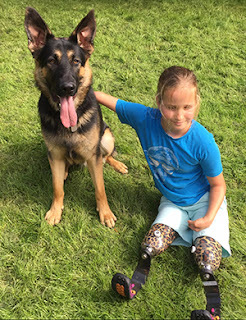 Rest in peace." Eva now has her own permanent puppy walkers Lisa and Martin in Plymouth and is pictured on our training get together 2 weeks ago. We did some puppy tracking, article searching and sit and down work. 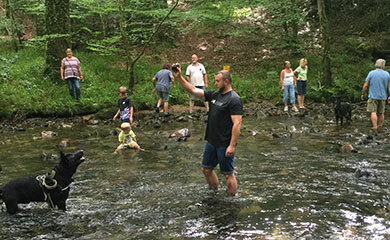 We couldn’t do too much due to the warm day. 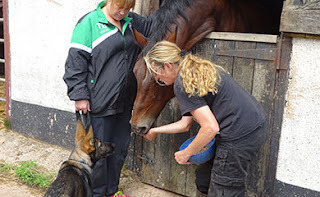 Here they are on video getting acquainted before starting our work. 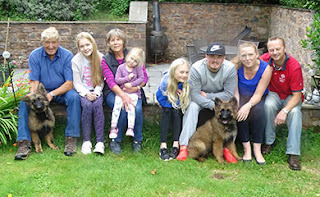 From left to right are Ella, Eva, Eric and Elsa. 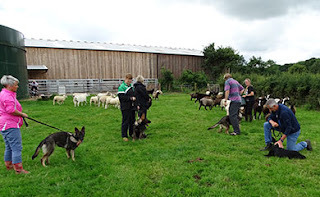 Our next training get together was last Sunday when we all set off for Saundercroft farm to meet the sheep, lambs, calves, chickens and horses with the farmyard GSD Holly thrown in for good measure. From left to right are Elsa, Eric, Eva and Ella. Elsa and Ella completely owned the place and if anything had to be corrected for over exuberance with the animals. 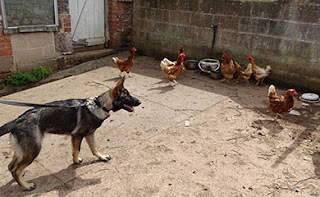 They are both a real handful and provided their hips and elbows are good when they are x rayed at 12 months I think they will take our breeding program to the next level. 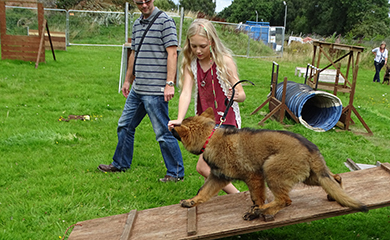 Eva was very cautious on meeting the animals and although she did improve she will need more work in this area. I was very impressed with the way Lisa handled Eva by being very patient and not forcing her into situations she wasn’t comfortable with. We always leave the chickens until last as they can get the pups a bit over excited. You can see from the video this is the best strategy because they have expended most of their energy and the pups were nice and calm. We have been busy with 2 training sessions since our last blog concentrating on tracking, article searching, recall’s, an introduction to person searching in a building and getting the pups used to water. 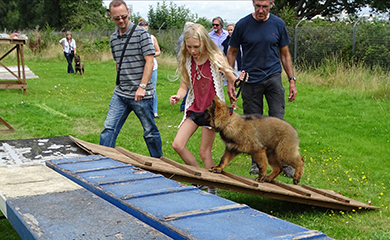 Unfortunately Tag and Tara couldn’t make the river training but the rest of the pups really enjoyed the day. 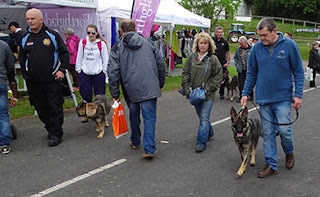 I got the impression the walkers enjoyed it more than the dogs. rounded off an excellent day. 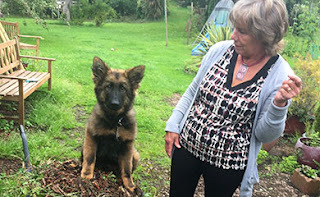 The bad news is after consultation with puppy walkers Terry and Jill I took the decision to release Tara from the puppy program. 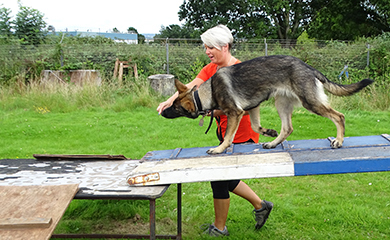 The decision was made because Tara hasn’t displayed the level of tenacity and determination needed in her play since going to her puppy walkers. 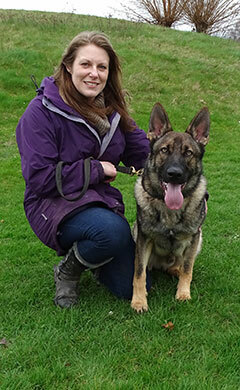 Tara is pictured here with Jill. 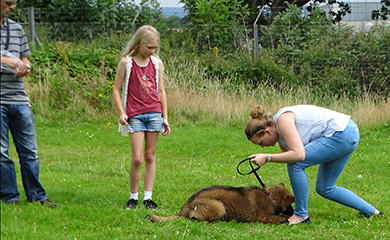 After visiting them it was obvious how passionate they are about German shepherds and that Tara will be kept busy with lots of sea walks. 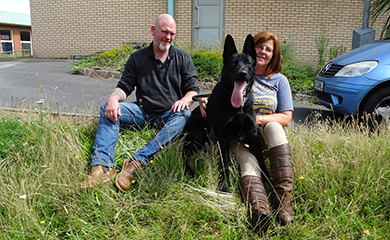 and Rudy will be on the September 2017 Initial Police dog course. Danno, Devon and Rudy have already been allocated to their new handlers and Dizzi is on standby if another handler requires a dog between now and the start of the course. 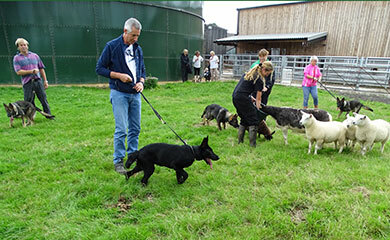 If not Dizzi will be kept for our January 2018 course. I will be doing a feature on all the dogs and handlers starting the course in early September. 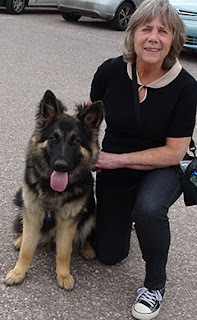 Since my last blog I have taken the decision to release Donna from the program. 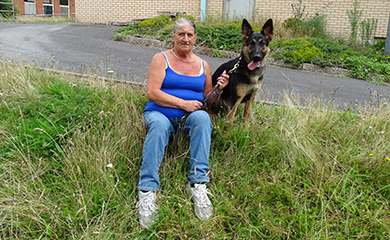 Her family have decided to keep her because there was never any chance that Jerry pictured here with Donna was ever going to let his beloved Donna go anywhere else. Donna has the most incredible working drive and tracking ability and I have no doubt she would have been very good at searching and locating criminals and missing persons. However she does have occasional insecurities and sensitivities to certain sounds which we havnt been able to eradicate. If there had been a handler available who knew her and was prepared to give her a try I still think she could still have made a very good Police dog but with these issues there would have been situations which would have caused her stress which would not have been good for her long term health. As for me I am on my way to Holland this weekend to select 2 male puppies from this lovely litter of pups. The mother of the pups Flash is also Rudy’s mother. 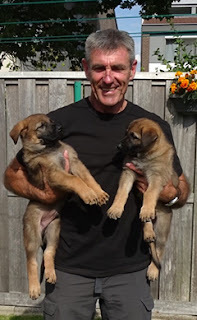 If they are anything like Rudy they will make exceptional Police dogs but will be a handful for their new puppy walkers. 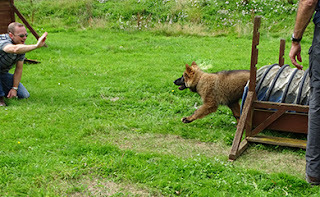 Finally if you want some peace and quiet a marrow bone will always do the trick for my three Ella, Sasha and Rudy. Till next time see you later.